Just over a month at Northern School for the Blind, and I’m [not] ready to leave. A K-12 school of 210, all but 10 students board here. Below are not necessarily highlights, because there are too many, but some idea of life at NSBCM, as I’ve known it. Week 4: Thorough review of new nouns – body parts, this time – again, videos don’t lie. “Head and Shoulders” and etc. Yes, the students with whom I’ve worked, especially the littles, are an ABSOLUTE HOOT. In between, there were field trips, the most notable being the one to what I thought was an enourmous rice field (photos, Facebook). We spent a long morning and part of an afternoon there, working on that rice. The following week I learned it was not RICE, but MUSHROOMS that had been packed in the straw we heaved into the long, rectangular mold and carefully pushed and pummeled until we could then lift out thebundles and set them in neat stacks. BTW, that experience was so typical of my weeks here, I can’t begin to tell you. Still, I’ve learned a lot. The first week I watched lessons about coconuts: how they are opened, where that incredible liquid actually spurts from, and where the meat is, in relation to the skin. Last week, one lesson I took part in was Sticky Rice on a Stick, which some inventive MN Thai has probably already introduced to the MN State Fair, but until this visit, I hadn’t seen. 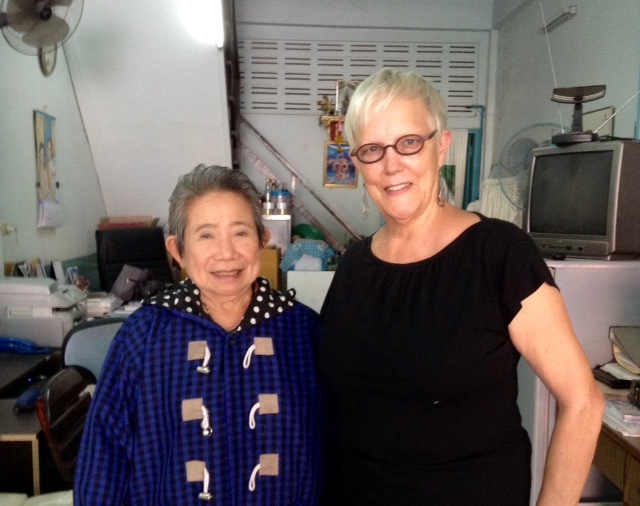 This past weekend, I went deeper into the Old City – near where Elizabeth and I stayed for awhile – for a haircut. This is the mother of the woman who cut my hair. And the haircut set me back… you don’t want to know, not if you’ve recently had a haircut in the U.S.
She watches over her daughter’s work. Her daughter is perhaps 2 years my junior. MUCH, MUCH MORE TO SAY, as they say, but I’m headed out to dinner with the person who has overseen me/answered every question I had and several I didn’t, given me driving tours of the area — and last week was in Bangkok receiving an award from the government. In Thailand, that means, of course, from royalty. 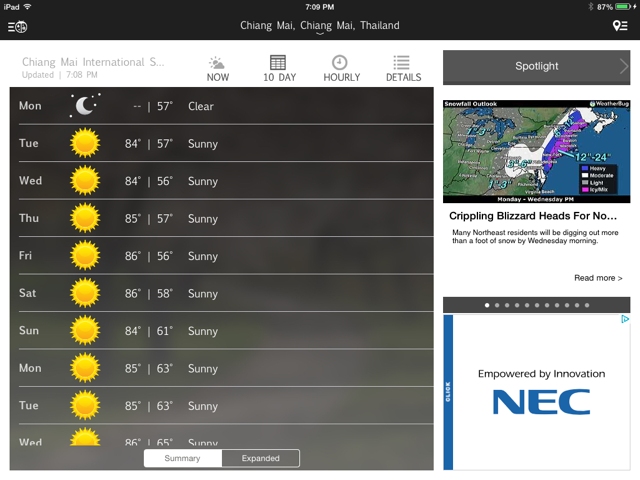 The weather forecast for the eastern U.S. at this moment – see it in top right of this weather forecast screenshot – has been mentioned here with what I can only call disbelief! I walk to work, passing many shrines, and sometimes, an enormous monastery. I also pass a 7-11 and several restaurants. If you double-click them, the thumb-nails should (!) enlarge. 7-11, where yesterday I counted SIX shelves of products like these. Imagine all that time @ Palm Beach Tan! If I walk to work the back way, and sometimes I do, I pass Wat Phra Sing, started in the mid-14thc…this Buddhist monastery covers several blocks, and has the fish to prove it. Wat Phra Singh also has the afternoon laundry to show it! Fried bananas, 7:30am. Nothing better. 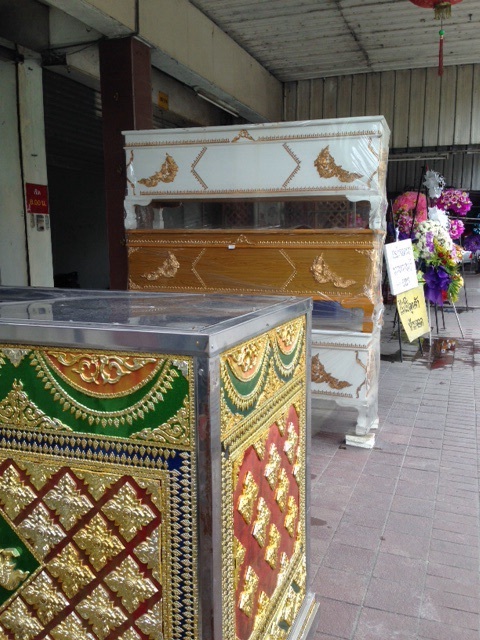 If I’m going any distance – Mass, museums, my favorite EngLish language bookstores – I take a Songthaew (“2 benches”), one of the ubiquitous Red Trucks of Chiang Mai. As long as I don’t ask, 20 Thai Baht, about 60 cents, gets me just about anywhere w/in the Old City. Here’s how it works for me: When I arrive at my destination and climb off, I walk to the front, hand a 20 TB note through the window, and with a huge smile, murmur, “Korp-kOOn,” as I walk away. Very Quickly. It’s not always a quick hop-on or hop-off,however. I’ve been known to flag down 4 or 5 Red Trucks before finding a driver willing to take me where I want to go. 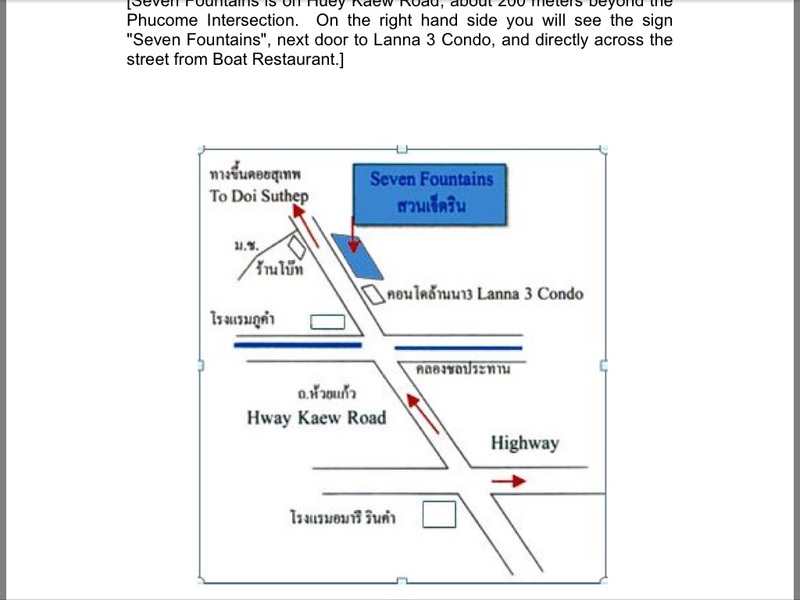 i live on soi 2, a studio apartment (truth? A large bedroom, with armoire & desk; a door from here leads first to a closet holding a refrigerator and plastic electric teapot; from the closet is a door to ithe bathroom: toilet, sink, and handheld shower head.). It works for me: breakfast here, terrific lunch at school, dinner, out. Every night. In an ideal world, if I could have either a personal chef or dinner out every night, I’d be hard-pressed to choose. Besides the funeral shop on my walk to work, I pass those places at the top of this page. The gods of technology are against me right now, so I’m forcEd to end here. I say: GO BACK AND LOOK AT THOSE NICE PHOTOS OF FRIED BANANAS AND WHITENERS AND WATS! New Year’s Greetings from Chiang Mai, where it’s already another year, and where lanterns in the sky during the day and night marked the transition to 2015! I’ve met some of the children from the Northern School for the Blind – and their lovely teacher/my connection to the school. We met at a festival surrounding a wat – a temple – on the other side of town, where the students were selling crafts they’d made. I took no photos of them and their wares, because it just felt intrusive on a first meeting, but I did get a chance to observe them, and how they interact with one another. They are all just kids (k-12), so unlike our Vision Loss Resources clients, have a different relationship with one another, and with their teachers; in any case, that’s my first impression. I’ll have a month to see what’s what. Sign outside the neighborhood wat.